Give this hungry cats a helping hand and feed some delicious fish! 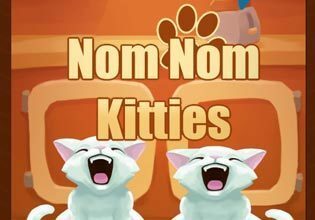 Tap and hold to open the mouths of the Nom Nom Kitties to feed them with an endless supply of fresh and tasty fish. The more fish you make the cats eat, the more points you accumulate. But be careful and stay focused to avoid the bombs that fly around at times. You surely don't want the cute cats to burst in an explosion, do you? If you manage to grab some goldfish, you will be able to unlock more cute kittens like the world famous Catstein or Bloody the cat vampire in this free HTML5 game.